This triangular shaped restaurant location at the corner of Montford Avenue, Boston Street and Hudson Street in Canton has gone through a number of permutations from Weber’s multiple owners, to the French incarnation with Dennis Manneville to Red Fish and its multiple owners. Renamed Meridian 54, it offers a refreshed, light and airy décor, a creative menu and a talented local chef, Russell Braitsch - this could be just the right mix. The bar pretty much remained the same as it has always been in decor but the dining room is a light, sunshine yellow countered with the subtle tones of the upholstered banquettes and harmonious sounds of the multiple waterfall panels. It was a sunny afternoon, just prior to Christmas when I met my friend there for lunch. It was great to find Chef Braitsch again, I knew him from his days as Chef-de-Cuisine at Corks when I was selling Vanns Spices. He’s has moved about a bit to Gardel’s, Noah’s on the Side, Iron Bridge and now stirring up his knowledge of flavors with a slant to Mediterranean on Meridian 54’s menu. 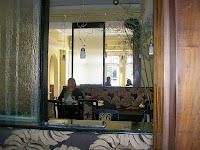 Desserts and breads are baked on premise and he utilizes free range, organic and locally grown products. Yes, four different menus: lunch, dinner, lite fare and brunch so depending when you arrive there is an appropriate menu. Let me start with lunch, because that is when I dined. We opted for the soup of the day ($6) which was a hearty brisket of beef soup that was served in a crock along with housemade bread, perfect for a cold wintry day. 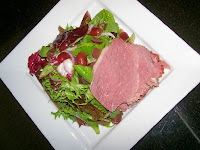 We shared the smoked duck and red grape salad dressed with a lovely lemon and cardamom dressing ($9). It was a generous portion of duck that accompanied the salad although my personal preference would be to have the duck not as chilled – a bit more to room temperature. We opted for the crab cake sandwich ($12) and Wagyu beef burger stacked on a Kaiser roll with applewood smoked bacon, wild mushrooms, Fontina cheese and a basil aioli ($12). 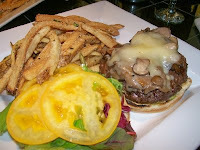 Both were accompanied with “Pops” hand-cut French Fries that are topped with Parmesan cheese, truffle oil and chives. They even brought out a sample of their house-made charred beef gravy for us to sample. I thought the burger was a winner both for taste and size. The crab cake was large, generous although it isn’t lump or backfin. 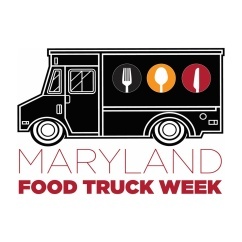 I think they have more interesting dishes and flavors to try – Duck Confit Pizza ($7), Shrimp Dumplings ($10), Mediterranean Sea Salt Baked Salmon ($12), Porcini Scented Breast of Free Range Chicken ($14). We wrapped up lunch with the Whoopie Pie ($6) and the Arborio Rice Pudding ($6). Honestly we only needed one dessert but you know me, gluttony is my middle name. 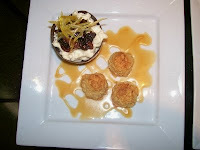 The rice pudding was Arborio rice in a chocolate cup topped with macerated figs and lemon zest served with macaroons. The rice pudding was yum and I liked the fig and lemon zest touch. I believe they are changing the accoutrements to this dish and taking off the macaroons. 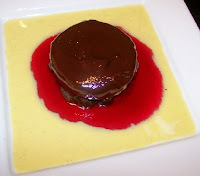 The Whoopie pie is very rich with a hint of peanut butter on a bed of raspberry coulis and crème anglaise. For $12.95 you get your entrée and a choice of a Bloody Mary, Mimosa or Sangria. The SOS (creamed chipped beef) is served with flat iron steak, Parmesan grits, braised spinach and buttermilk biscuits or the Belgian waffle- both tickle my brunch palate, sweet or savory. Brunch is served Saturday and Sunday from 10:30 a.m. to 2:30 p.m. Check out the links below for a look at the dinner & lite fare menu. If you haven’t made arrangements for New Year’s Eve, this might be a good alternative for you. They are offering multiple prefix menus for the evening, food served up until midnight. In conclusion, I think the dining room makes a good destination for an upscale business lunch – a really nice atmosphere, subtle – no flat screen TV’s in the dining room distracting you from the joys of conversing with others. 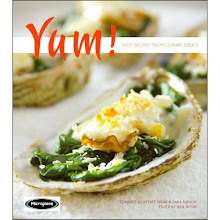 Meridian 54 is still refining their soul but they are all heart will Chef Braitsch’s culinary expertise. The question always is would I return and the answer is yes.